American Indians face a double whammy when it comes to authenticity: how do you know what is real? As a die-hard empiricist, I never thought I would turn to critical theorists to illuminate American Indian authenticity. But here I am. French scholar Jean Baudrillard argues that what we come to know as real, as authentic, is actually a simulacrum of what was once the original. Pretty much everything is a counterfeit to the authentic. Indians get disparaged because we are not our ancestors. But what we come to know as our ancestors are renderings from popular culture. Recall the scenes from Dances with Wolves where the Lakota are encamped. We tend to equate such filmic representations as reflections of the real. But they are inventions. Baudrillard contends that our sense of the authentic marches backward. Our evidence through which we judge the authentic arises from contemporary illustrations which are far removed from the original. 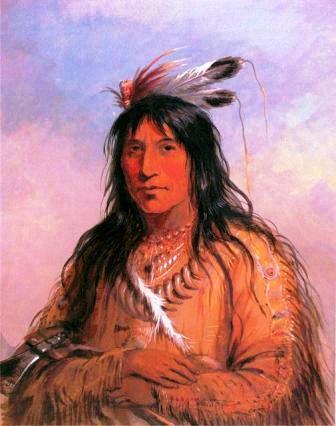 Consider one of my ancestors, the Lakota leader Bull Bear. I know him through Francis Parkman’s book The Oregon Trail and by the painting by Alfred Jacob Miller (pictured) which he etched during his journeys in North America with William Drummond Stewart. Bull Bear is forever recorded on canvas and in Parkman’s writings, and not too kindly. But how do I know whether Parkman has accurately captured my ancestor, said to have had “a fearless spirit, and a most impetuous and inflexible resolution”? The answer is I can’t know, at least not through such representations. Attending to the empirical evidence can only give us a slim slice of the whole picture, which, in effect, is unknowable. Perhaps our constant search for the authentic is fruitless. Maybe we should be asking a different set of questions. This entry was posted in authenticity, cinema, Francis Parkman and tagged stereotypes. Bookmark the permalink. It was a pleasure reading your blog! I’d be interested in hearing what your view on what the different set of questions would be. Russ: Questions that emerge from tribes have more currency with me, rather than questions imposed from outsiders, so I lack the confidence to frame the right questions. My tribe puts a lot of stake in language studies and cultural preservation, so I think they’re asking the question: How can we preserve our traditions? Thanks for the nudge.